A small European satellite began its mission Wednesday to peer into the blinding light of nearby stars in an attempt to discover the first rocky planets outside our solar system. The craft was launched at 1423 GMT (9:23 a.m. EST) from the Baikonur Cosmodrome in Kazakhstan. The Soyuz rocket and attached Fregat upper stage successfully deployed the COROT spacecraft into orbit about 50 minutes after liftoff. The flight was the first use of the new Soyuz 2-1b model of the venerable rocket. The new version is the second step in an overhaul of the booster, and includes a more powerful RD-0124 third stage engine and a digital control system already tested. The upgrades will help facilitate launches of the Soyuz rocket from Europe's spaceport in French Guiana by 2009. COROT, which stands for Convection Rotation and planetary Transits, will spend the next two months undergoing a comprehensive test and checkout phase before it is declared operational in February or March. Built by Alcatel Alenia Space, the nearly 1,400-pound satellite will operate in a precisely polar orbit with an altitude of about 557 miles and an inclination of 90 degrees, according to the European Space Agency. COROT's science team will spend most of their time on two primary mission objectives for the satellite. Led by the French national space agency, CNES, the two-and-a-half year mission will be the first dedicated to searching for mysterious worlds beyond our solar system. In addition to seeking out extrasolar planets, COROT will also measure seismic waves traveling across the surface of stars in an attempt to learn more about stars' internal processes. Studying these vibrations can help astronomers determine the star's mass, age and chemical composition. COROT carries a 10.6-inch telescope and a visible camera that will image more than 120,000 Sun-like stars in the Milky Way galaxy during its mission to find extrasolar planets. Approximately one hundred stars will be analyzed to study stellar vibrations. The science equipment will look for signs of planets by detecting occasional oscillations in the brightness of stars. The change in a star's brightness is often a tell-tale sign of a planet passing in front of the star. Since the confirmation of the discovery of the first exoplanet in 1995, more than 200 other planets have also been found orbiting other stars. All of the planets found so far have been giant Jupiter-like gaseous planets tightly circling their parent stars. Most of these so-called "hot Jupiters" have been found using ground-based telescopes. Without the blurring effects of Earth's atmosphere, COROT's telescope could drastically reduce the threshold for detection of extrasolar worlds. Scientists expect up to several dozen rocky planets a few times larger than Earth could be found during COROT's mission. Astronomers also predict many more discoveries of large gas giants. "COROT could detect so many planets of this new type, together with plenty of the old type, that astronomers will be able to make statistical studies of them," said Malcolm Fridlund, ESA's project scientist for COROT. COROT is designed to seek out terrestrial planets that complete an orbit within 50 days, placing them very close to their parent stars. Many of the targets for COROT's planet-finding mission are red dwarf stars with relatively low heat output. "COROT will provide the first mapping of rocky planets around other stars," Fridlund said. The mission is split into 6-month phases, during which the spacecraft points toward objects near the central portion of the galaxy or toward stars away from the center of the Milky Way. Each phase is divided into two observing runs of 150 and 20 days, according to CNES. The longer observing periods will provide the best opportunities to search for Earth-like rocky planets, while the 20-day observing runs are best suited to finding gas giants. COROT's partners include the European Space Agency and scientists from Germany, Spain, Belgium, Austria and Brazil. Concept studies for the project began in 1994, followed six years later by the final decision to proceed with the COROT mission. A cooperation agreement was signed in June 2001 to bring ESA into the program. "ESA has been working for a long time towards the detection of Earth-like worlds around other stars," said Sergio Volonte, head of ESA's Science Planning and Community Coordination Office. COROT will be joined in 2008 by NASA's Kepler probe, which carries a 37.4-inch telescope that should be able to spot rocky planets even smaller than the size of Earth. Scientists believe Kepler could discover up to 50 extrasolar planets no larger than Earth during its four-year mission, according to NASA. 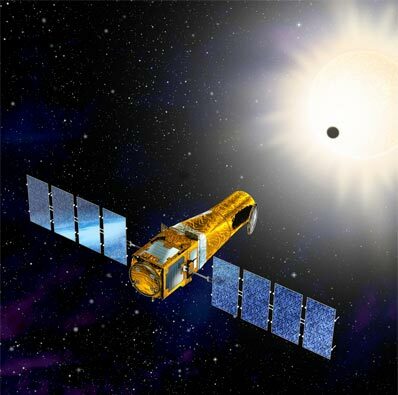 Several more advanced planet-hunting missions are being assessed by U.S. and European astronomers for launch in the next decade.